A well known renaissance genius, Da Vinci dabbled in science, maths, painting, sculpture, architecture, engineering, literature, geology, astronomy, anatomy, writing, botany, history? you name it. 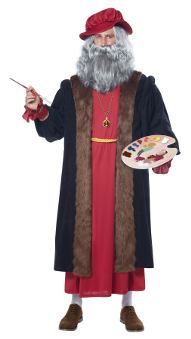 Perhaps this Da Vinci costume will endow you with a few of his many talents. At least you'll look the part in this renaissance costume.